As a blogger or online business owner, you might think Pinterest marketing during the holidays is just for big retailers or online businesses. Think again! From October through December is the most traffic-driving time of year for many bloggers! If you’re looking for Pinterest marketing ideas that are actually easy to implement, give these holiday marketing tips a shot. 1. Share holiday pins or boards with your email list. The caveat: only share pins that lead to your content or boards with a lot of your content on them. Don’t waste this opportunity sending them content to other peoples’ websites. For example, if you have a few pins of great ornament crafts to do with kids, tell your subscribers to pin them for next time they have a rainy, cold day. Or if you have a pin leading to a list of the best non-fiction books of the year, same thing. Or maybe a board of incredible travel ideas for winter. I have a post for free holiday fonts that always drives traffic back to me this time of year. So, I might tell my email subscribers to save this pin for later when they’re ready for making Christmas cards, place settings, or even writing a letter from Santa to your kids. Your To Do: When you write your next email to your audience, include 1-3 pins that are highly relevant to the topic you’re covering. Remind your subscribers to save the pins to read later when they have more time. It’s pressure-free! 2. Encourage friends, family, subscribers, or customers to GENUINELY add a comment or Tried It photo to your pins. Pinterest weights a pin more favorably when there are comments on the pin or photos uploaded to it. Great engagement boost! Don’t be shy about asking people to engage with a particular pin of yours. Just be specific and don’t be spammy. For example, if you sell products you could ask customers who bought that product to leave a comment on your pin saying why they like it. They could also leave a picture of the product in use as a “tried it” comment (“tried it” isn’t JUST for recipes or crafts)! Or you could share an article of yours within your email list, then ask people to leave a comment on its corresponding pin if the article helped them. Your To Do: Ask someone to comment on one of your pins in a way that’s genuine. Asking someone in this way isn’t artificial. Just don’t turn it into a contest or offer a reward for doing so. When done right, it’s no different than a company asking for a review! 3. Use popular, seasonal keywords. If you only work on ONE thing to drive traffic to your website from Pinterest, it’s this: include relevant keywords in your pin descriptions. From holiday sales to winter photography, Pinterest fills up with a wide range of holiday content. Remember Pinterest works like a search engine, not a social media platform. Even if you don’t write about the typical holiday season topics like home decor and food, there are plenty of opportunities to drive traffic back to your blog or website. In fact, grab this Pinterest holiday keywords guide for ideas. Your To-Do: Click above to grab the keyword guide, then work relevant keywords into your pin descriptions. 4. 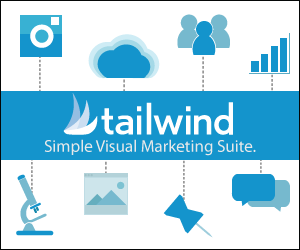 Use Tailwind’s SmartLoop to pin seasonal content on autopilot. With SmartLoop, you can save pins to certain boards over and over and over at a pace that you set. Tailwind works with Pinterest to ensure these aren’t seen as spammy. You can even turn loops off and on, like for seasonal content! While you might spend a little time setting up your pins to loop, it’ll make the rest of your holiday season easy peasy. Your To-Do: Sign up for Tailwind and give SmartLoop a try (there are lots of videos to walk you through). 5. Create a gift guide. Gift guides are not only a great way to boost traffic to your website – they can also earn you passive income! Often times a holiday pin may take off even better the following year so don’t get discouraged if your post doesn’t skyrocket this year! Simple gift guides work best. Just use product images along with links to purchase the product. Please don’t do those PDF or e-Reader type gift guides. People will hit the back button rather than download something or flip through an online magazine. Get specific with the audience you’re trying to target: a gift guide “for her” isn’t good enough these days. Go deeeeeeper like a gift guide for women who love nature. Don’t list too many products. No one is gonna scroll through 50 stocking stuffer ideas. They’d much rather browse 7-15 more specific ideas. If you want to see a gift guide example, see my Practical Gift Guide for Female Entrepreneurs. Your To-Do: Make a list of potential audiences you’d like to target, then build a specific gift guide that fits your niche! If you need templates for your gift guide pinnable image, our Pinning Perfect course comes with seven of them right now! 6. FOR SHOP OWNERS: Redirect old products to a new page. As a Pinterest user, I’m sure you’ve had this happen. You see a pin of a product you want to check out, then click only to go to a dead 404 page. The worst! If you’re a shop owner, especially of physical products, then make sure old products direct someone to another product. Otherwise, they’ll hit the back button and be gone for good. Depending on your tech level and the platform you use, the way to do this can differ. For out-of-stock products, consider adding a link within the product description that links out to a similar product. If you can customize your 404 page, then add a link to your shop home page with a note so it sounds personal (ex. “Darn! The product you were looking for is no longer available, but we’re sure you’ll find something else that’s perfect for you here.”) For those of you who can do more technical things on your site (or have someone who can), set up 301 redirects to redirect old products to a related existing product. Your To-Do: If you’re a shop owner, take some time to fix the dead links from products pinned on Pinterest. 7. Don’t forget to pin content in the holiday season for January and February topics! If you want to see more detailed ideas for each of these, and other Pinterest-loving holidays, check out Pinterest’s Possibilities Planner as well as my keyword guide linked below. Your To-Do: Check out the planner to see what topics for January and February are trending now. If you have content for them already, go ahead and add them to your pinning schedule. Don’t even worry about updating them until after the holiday season. Just pin them! Seven tips. Seven to-dos. Pick 1-2 to tackle first. And don’t forget to grab my free Pinterest holiday keyword guide for the holidays! These are some great suggestions. I never thought to put pins in my email with a suggestion to pin to read for later! I’m going to be adding that to my list for sure. I’m really struggling with engagement on my pins. I’ll ask some family and friends if they can help me out, but how do you get engagements organically? Really Grateful Article, I was Searching For Blog And Found Your blog, it Will be Really helpful to Me Now I Am Going to bookmark This Blog Link For Future. Thanks for posting this at a moment like this. As I’m new to pinterest, this is coming helpful. I wanted to read your blog, I enjoyed reading your blog. there is a lot of good information on your blog, I loved reading it and I think people will get a lot of help from this Facebook customer service number blog. Sam, I have written this kind of blog, You can also read this blog. I think you will get a lot of help from this too. I hope you like my blog, I hope you got a lot of help from this blog. I like the helpful info you provide in your Blog. The Blog is very interesting and effective. Thank you for sharing informative article. Nice Post! thanks for sharing this article. Awesome Article 🙂 Very Informative! Thanks for sharing with us valuable things. These are some great suggestions. I never thought to put pins in my email with a suggestion to pin to read for later! I’m going to be adding that to my list for sure.thanks for sharing this wonderful article with us. These were the great suggestions you have given.i thinks for getting referral traffic from pinterest is good technique.thanks for sharing this wonderful article with us.